Sometimes, the world can be an ungrateful place. The last time Lo Wang was seen at the end of Shadow Warrior, the world had been saved from the forces of the Shadow Realm. Unfortunately, since Wang had spent the entirety of that game jumping back and forth between that dark world and the human realm, the barrier between the two realities was shattered. To say the least, Lo Wang isn't as popular as he used to be, as Shacknews took an early look at Shadow Warrior 2 during E3 2015. 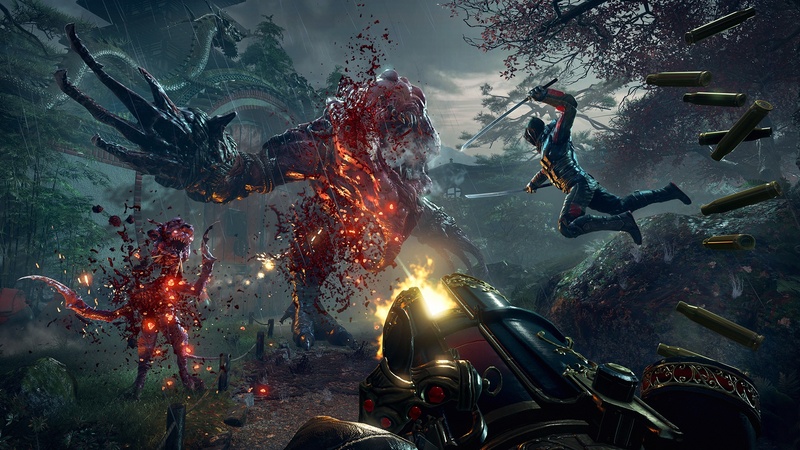 Shadow Warrior 2 takes place five years after the events of Flying Wild Hog's 2013 reboot. The human world and the Shadow Realm have merged together, meaning demons now live among the people. Lo Wang is no longer the hot free agent that he was at the start of the series. He's not without friends, though, as he can recruit sidekicks to play alongside him in four-player online co-op. Flying Wild Hog's in-house Road Hog engine has been completely upgraded for Shadow Warrior 2. Linear levels are now a thing of the past, as Wang will be able to explore larger levels with traversal opportunities added. Enemies can now be taken out in more gruesome ways, with an improved cutting system that includes procedural damage. Limbs and body parts can either be sliced off with a sword or blown off with a gun. Lighting has been significantly improved to help bring some extra life to the open stages, as well as the new open world hub. This ancient temple is where Wang will pick up his main story quests, his side quests, and his grind missions. The latter of those will see Wang take on hordes of enemies to help him earn upgrades, with those stages' terrains and landscapes randomly generated to help keep them fresh. With new weapons comes the need for a new loot system. Shadow Warrior 2 will feature over 70 different weapons, varying from firearms to swords. Each of these weapons can be upgraded with pickups, such as an Essence of Ambidexterity that attaches to a gun to allow Wang to dual-wield it and a Component of Blight that can add ice power to any of his blades. Weapons will need to be badder, since there will be over triple the enemy types from the first game, including the hulking samurai demon seen in the trailer. Enemies will also be noticeably smarter, so if Wang tries to pick any off from high places, like rooftops, they'll be able to find him and climb up to his location. Friends will be able to team up to take on larger foes, however, because of Shadow Warrior 2's new emphasis on larger levels, it's entirely possible for friends to split up and take on portions of levels individually. If they do decide to stick together, they can utilize different tactics, like using freeze to set up a partner for a takedown. Now that friends can get together for Shadow Warrior 2 sessions, that leaves one burning question: Will four people have to fight over who gets to play as Wang? After all, Wang's the one with the witty one-liners and the badass swagger. Flying Wild Hog has taken this into account and noted that any player on any team will see themselves play as Wang and their friends as Wang's sidekicks. This way, everyone gets to be Wang. Unlike the first Shadow Warrior, there will be no staggered release schedule this time around. Look for Shadow Warrior 2 to hit PC, Xbox One, and PlayStation 4 on the same day in 2016. I loved the first one (remake I mean, original too! ), the sword was so much fun to use. This was one of the surprise highlights to come out of E3 for me. The first one was decent but it looks like they're really stepping up their game for the sequel. The gameplay they were showing off on the twitch or youtube stream looked amazing.